Saturday at essentially the end of "Invitational Season" for California cross country athletes turned into college commitment announcement day. Or at least a day of confirmations. Claudia Lane posted her choice of Dartmouth on her Instagram page (photo above), while Kristin Fahy and Walnut's Arriaga sisters, Chloe and Emma, confirmed their selections at the Mt. SAC Invitational. Fahy, the two-time San Diego Section champion who ran an impressive 16:50.4 to win Saturday morning's elite girls race, is headed to Stanford, she confirmed Saturday. The Arriaga girls of Walnut High, selected UC Davis, Chloe said after running third (17:21.0) in the race won by Fahy. Fahy's teammates at La Costa Canyon, Garrett and Jacob Stanford, confirmed their selection of BYU. Lane, the two-time Foot Locker National champion, as well as two-time CIF-Southern Section and CIF-State champion whose fall season at Malibu High has been postponed by injury, posted the news on her Instagram account on Saturday. 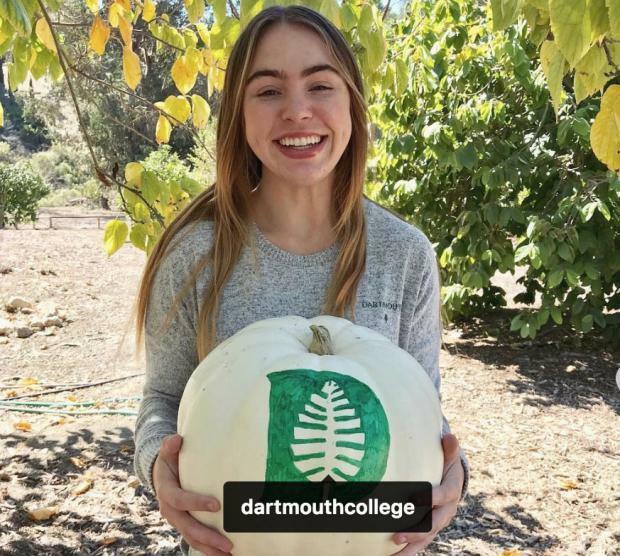 In a follow-up on her posting, she told MileSplitCA: "Dartmouth was absolutely the perfect choice for me," Lane wrote in a text. "I've always wanted to go to school in a place surrounded by nature and by people who love the outdoors as much as I do. I love everyone on the team. They are so hardworking and dedicated while at the same time are so fun, awesome, and genuine! I love the smaller class sizes there and how every student can get to know their professors well. I love the coaching staff and honestly every part about the school. Also, I can finally live through four seasons! Haha! I couldn't be more excited." Chloe Arriaga said she wanted to remain close to running and become a coach, while Emma "wants to do animal sciences because she's hoping to be a wildlife veterinarian." Emily Perez of St. Joseph Notre Dame announced her commitment to Oregon State on her social media accounts on Thursday.